In early 2002, Steve Matthiasson began doing vineyard consulting in Napa Valley with Premier Viticulture Services, connecting, as a result, almost immediately with George Vare, as well as Vare’s home vineyard of Ribolla Gialla and Cabernet Sauvignon. The 2.5 acres of Ribolla promised new insights for Matthiasson into the care of whites, as the grape’s vine needs differ from those of other varieties. Vare had connected already with winegrower’s through Friuli and Slovenia that worked with Ribolla, having brought his suitcase clone from Italy at the start of the new century. Sharing their advice with Matthiasson, Vare and Matthiasson explored the European guidance, and some trial and error on what the grape needed in the vineyard. In the mid-2000s, the pair, along with winemaker Abe Schoener, and Vare’s wife, Elsa, traveled to Friuli, and met too with winemakers in Slovenia. It was Alek Simcic, Matthiasson explains, that brought he and Vare out into the vines to show them directly how to thin the grape. Ribolla Gialla offers a unique blend of fussy in its early season vine care, but hearty there after. Unlike other varieties, the leaves of Ribolla must be pulled to expose the newly formed clusters to sunlight immediately. As Matthiasson explains, if leaf pull is done early, the clusters form their true yellow color without sunburn. Without sun exposure, the clusters can burn later, or stay green, never adequately ripening and never reaching their enjoyable flavor. The vine also regularly shows extra clusters, with two or three smaller ones on top that never fully ripen, and thus should be removed early to allow the larger, true-ripening formations to grow properly. Matthiasson showing me the unusual cluster formation of Ribolla Gialla. The two lower formations, near his hands at the base of the photo are properly ripening clusters. The two upper ones are dummies that detract from fruit quality, and never fully ripen. With Vare’s support, and small winery space, Steve and Jill Klein Matthiasson began their own Matthiasson label, starting their wine business with only 120 cases in 2003. The Matthiasson’s red blend has relied on a truly classic approach to a Bordeaux blend, using the same vineyard too from its inception. Vare also encouraged Matthiasson to use the Vare Vineyard Ribolla Gialla. The suggestion led to the Matthiasson’s establishing their white blend, based always in a combination of four grapes–Sauvignon, Ribolla Gialla, Semillon, and Friulano–brought together in an utterly clean, straight-to-press style for the sake of freshness. With the label’s foundation in such an uncommon grape as Ribolla Gialla, Matthiasson realized he needed to secure his label’s future by planting more. With Vare’s permission, then, Matthiasson took cuttings from Vare Vineyard and established about an acre of Ribolla Gialla on the family’s then newly purchased home property. The Matthiasson’s had just moved onto the land in 2007, and the first thing they did was establish the new Ribolla vines. The intention for the Matthiasson Ribolla plantings includes becoming the backbone of the Matthiasson white blend should the label ever need a new source for Ribolla Gialla. The Ribolla at Matthiasson Vineyard was grafted onto roots originally planted in 1997, allowing harvest to be taken as quickly as 2008. With the Vare Vineyard secured for the Matthiasson white blend at the time, Steve chose to keep his own home vineyard fruit for another purpose. That year, Matthiasson made his first single varietal Ribolla Gialla from the Matthiasson fruit. His method was to simply pick, and ferment the wine directly in the vineyard using whole clusters, then pressed at about dryness and aged in barrel in the family barn at vineyard side. The 2008 through 2011 vintages of Matthiasson Ribolla Gialla varietal were each made this way, though the family did not keep the results of the 2009 vintage. In 2012, however, Matthiasson decided to change his approach. There he chose instead to ferment and age the fruit in winery, striving to make a truly non-reductive, non-oxidative wine of white grapes in a red wine style. For ’12, then, he fermented whole clusters in tank, then pressing it at dryness to age in continuously topped-up barrels. In Matthiasson’s view, the new approach allows for a better focus on site and variety, which he wants. The 2012 will age for at least 20 months in barrel. Differences in concentration are due partially to vineyard planting. Where Vare utilized a traditional Guyot style, 1 cane per vine approach, Matthiasson’s site relies on a Lyre arrangement. To put it simply, one vine at Matthiasson’s Vineyard is doing 4 times the work a vine at Vare’s has to do. Site specifics also differ in soil and temperature. Vare Vineyard rests at the base of Mt Veeder, pooling with cool air and fog at night, while heating more during the day. Matthiasson’s, on the other hand, sits in more open valley floor, thus staying a touch cooler in day time, a touch warmer at night. Where Vare soils are truly rocky and volcanic challenging the vines through ample drainage, Matthiasson’s are a mixed loam. Finally, Matthiasson explains he also manages the Vare Vineyard site differently than he does his own. The reason is simply because of Vare’s own style preferences. At the Vare site the fruit is more thoroughly thinned, a practice Matthiasson tends more to avoid at home. The current release of the Matthiasson Vineyard Ribolla is the 2010. It comes in at outrageously low alcohol of 10.9% with a bit of pleasing funk on the nose alongside fresh greenery and citrus salt. The palate is dance-y showing ground almond cake, with yeast bread elements and a bit of tang on the finish. The wine has viscosity but smooth slippery, ultra light tannin, and a long glow-bright finish. George and Elsa had long intended to sell their Napa home and vineyard property. 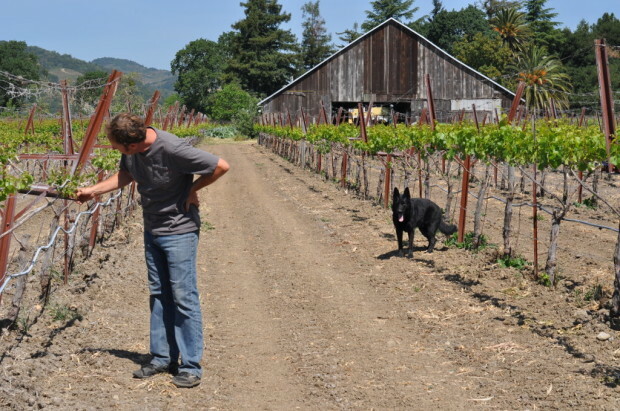 Though Matthiasson currently manages the care of the Vare vineyard, there is no lease agreement. As a result, when Elsa succeeds at selling their home, the new owners will determine the future of the Vare Vineyard fruit. Thank you to George and Elsa Vare. Blessings to the Vare family. Consider your knowledge bomb dropped for the day! So inspiring and refreshing to read your writing Miss LEHWKWK, thank you for all you do.